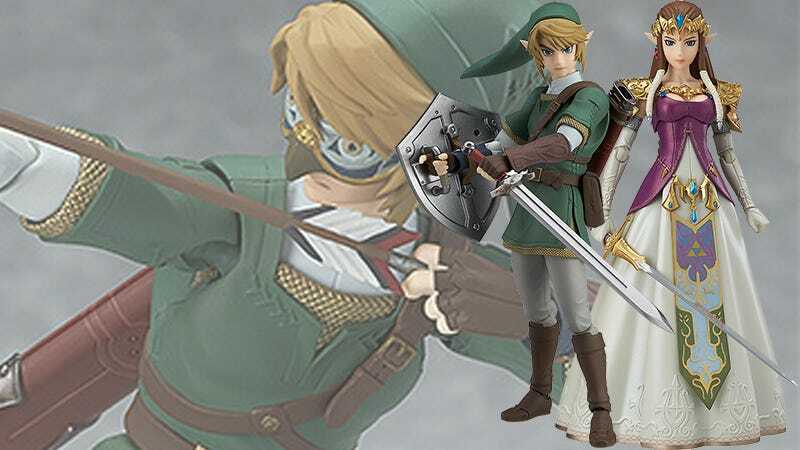 Normally I’d pick fancy dress-wearing Zelda fover plain old green elf any day, but the DX version of The Legend of Zelda: Twilight Princess’ Link, packed with everything from the Ball and Chain to the Hawkeye mask is making it hard to decide. Up for preorder today through October 27 at the Good Smile Shop with a release date of May 2017, the Figma Zelda and Link from Twilight Princess make for a stunning couple of new figures in the popular Japanese line. Zelda might not be as articulated as Link, what with the long dress and all . . .
. . . but she’s more than capable of handling herself should the need arise. If it came down to price, Link’s $56.99 is slightly better than Zelda’s $61.99, but his dress isn’t nearly as lovely. It’s all Zelda’s game until the $65.99 deluxe Link brings out the accessories. What’s a dress when you’ve got a Clawshot? Plain Link is fine, but when he starts accessorizing, things get crazy. Well, at least I’ve got a month to decide, followed by at least seven months of wondering if I chose wisely. Stupid pretty Figma figures.